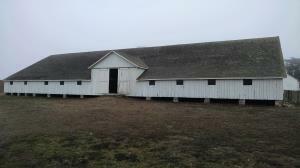 The most impressive structure at the Pierce Point Ranch site was the large dairy barn. The Tomales Point Trail starts just to the left of the barn. Coppertone and I saved our longest hike of the trip for the last day. The trail starts off at the historic remains of the Pierce Point Ranch, which had raised cattle for dairy and meat from 1858 through 1973. The trail surface is largely packed dirt, but turns sandy in spots. Actually the last mile before the point is almost all sand and takes a lot out of already tired hikers. The trail follows the ridge line, slightly west of the ridge's peak, on the Pacific side. This means few, if any trees and lots of grass and shrubs. Sunscreen is a must on sunny days. We both got a bit of a burn from the failure to heed our own advice and it was rather overcast on our visit. 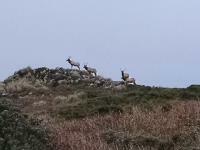 One of the draws for Tomales Point are the Tule Elk. Nearly driven to extinction, their numbers are on the rebound and there's likely no better place on Earth to see them than here. Any thought about being disappointed if we failed to see any were dashed both at the trailhead, where a few foraged on a distant hill and two miles into the hike, where a herd lay down to rest. Actually we saw elk in numerous places along the trail, no more consistently than around the largest pond on the point. When reaching the top of Tomales Point the trail snakes around some rock and into some gouges that have worn down some of the softer sedintary rock. It was a nice place to sit and eat a snack and watch the ocean waves flow into Tomales Bay. 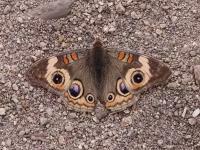 We were not alone at the turnaround point. Spread out over 10 miles out and back, there were often times when one might be on the trail and not see anyone else in either direction. But that did not last long. For a trail of this length it's fairly popular.